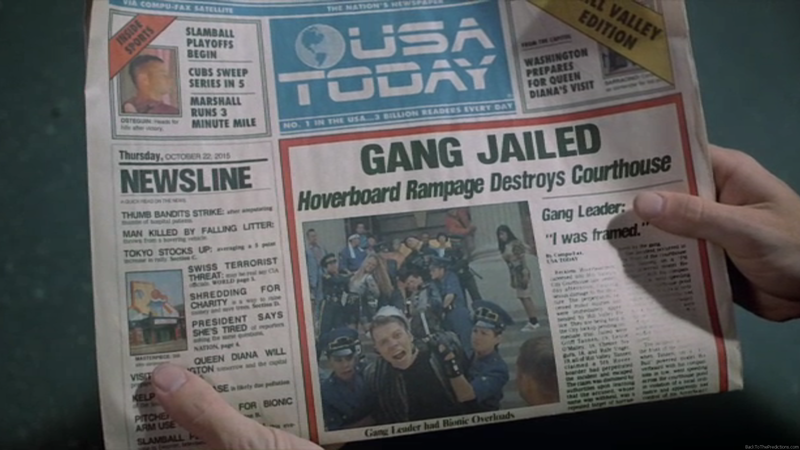 When we get a good look at the USA Today newspaper after Griff and his gang crash into the Courthouse Square Mall, we can read the headlines for a number of featured articles. One that stands out the most is mentioned twice. Unfortunately, it’s also one of the first failed 2015 predictions made in Back to the Future Part II. In the upper right corner of the front page is a headline reading “Washington Prepares for Queen Diana’s Visit”. On the left side in the “Newsline” section, a headline reads “Queen Diana Will Visit Washington”. Diana, Princess of Wales ended her marriage with Prince Charles on August 28, 1996, therefore meaning she would never have the title of “Queen Consort”. Tragically, Diana died in a car crash a year later on August 31, 1997 in Paris, France. Had Diana not divorced Prince Charles and had she not died in a car crash, this prediction still may not have come true because (as of this posting) Queen Elizabeth II is still alive at age 88.